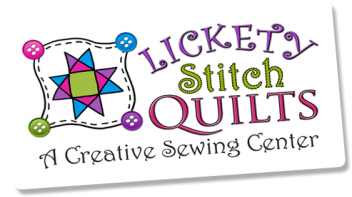 Make sure a trip to Lickety Stitch Quilts is on your calendar for January 26. Join the scavenger hunt and follow the clues to search for the "Golden Bobbins" throughout the shop. If you find one, you win the prize. Our Clearance Room is stuffed full with savings up to 75% off. In addition, we will have select kits on a super special for that day only. We are excited to announce our first Judy Niemeyer Class coming up in March. 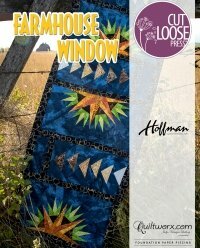 Michele Everts, who is training to become a certified Judy Niemeyer Instructor, will be teaching Judy Niemeyer's Farmhouse Window Table Runner. 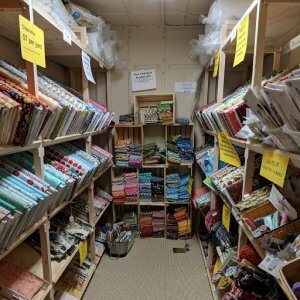 She assures us that it is appropriate for all levels, even beginning paperpiecers - and will be a great introduction for techniques used in Judy Niemeyer's patterns. If you are interested in taking this class, please call to get your name on the list. The details and supply list are still being worked out - but I wanted to let everyone know so you can get it on your calendar and reserve the days. Cost for the two-day class will be $99 plus supplies. Seating is limited to 6 participants, so call 307-334-9963 to reserve a spot. New sizes of Quilters Select Rulers are now available. These are the best rulers hands down for not slipping when you are cutting your pieces. If you haven't tried them yet, stop in for a demo! We have had a week of not being able to send or receive emails, so if you have sent us anything by email, we likely did not get it. Please resend! It is up and running again, and hopefully will stay working!